Want to raise your IG game while in Athens? Here’s where to go and what to shoot to see the likes roll in. We talked to some of our favorite Athens Instagrammers, and they gave us their best tips for where and what to photograph to get great shots in the city, whether your feed features fashion, street views, nature, food or all of the above. One of the areas of Athens most frequently pictured on Instagram is Anafiotika – a small neighborhood in the historic Plaka district, beneath the Acropolis. While the excellent location is sought after and expensive to live in today, the old houses here were built by common people who once arrived in Athens from the Cycladic islands (and specifically Anafi – hence the name). Thanks to their influence, this neighborhood resembles an island town, with small white-washed houses with colorful shutters, bougainvilleas, flower pots on the curbs, and lots of charm. Digital influencer Konstantinos Siahamis (@ntinos_siahamis), who has over 26 thousand followers on Instagram, says that “just when you think you think you know Anafiotika, you will discover a new photogenic nook, door, or alley”. Take the green metro line (30 minutes from Monastiraki to the Irini station) to the Olympic Athletic Center of Athens (OAKA), where the 2004 Olympic Games were held, and get some amazing shots of and selfies under the vaulted open-air arcade called the Agora. Few tourists take the time to make this stop, but the scenery unbeatable. As with the Anafiotika, urban photographer Panagiotis Koutroumpis (@goatherd_k) reminds us again that just because you’re not the only one capturing something, that doesn’t make it a bad shot. The street performers in Monastiraki Square, Ermou Street, and Syntagma Square (in front of the parliament building) are plenty and diverse. Many people stop to take a picture of at least one of them on their way to the shops. Breakdancers often gather at the Kapnikarea church, in the middle of the pedestrian part of Ermou, and with a fast shutter speed you may get some really good pictures of their moves. Street musicians at night make for nice, moody Insta story videos. A word of warning, however: be extra careful with your equipment here, as pickpockets keep an eye out for expensive cameras and phones used to capture the performers. The Acropolis may be tall enough to claim rights to one of the best views in the city, but the most exciting and vivid images from above can be taken from the city’s many rooftop bars and hotel terraces. A for Athens is a classic choice, for good reason. The view from this café-bar combines the street scene in Monastiraki Square with the colorful houses of the Plaka neighborhood above it, and, sitting like a crown on top, the Parthenon. Featuring a large open space, clean architectural lines, people in action (running, cycling, walking their dogs), multi-million dollar luxury yachts, and a view of the sea, Marina Flisvos in Palaio Faliro is a great place to shoot. On weekdays, it’s not busy at all, so you won’t bother anyone as you take your time to get the perfect shot. Athens is surrounded by mountains, and it can be worth it to take a forty minute trip up into the hills, if nothing else, to get a sense of the vast size of the city, and to get some pictures of it as the sun sets and the lights start to turn on. It is a hypnotizing experience, and you’ll be able to get some great photos and time-lapse sequences. Instagrammers using professional photo equipment will get the most out of it. (Check out this video for inspiration). According to Kountroumpis, the best mountain to visit is Ymittos, as it is often covered in a very photogenic blanket of light fog. Plus, the sun sets on the “right” side of this mountain, as opposed to Parnitha – another popular day trip destination. If you’re in Athens for the first time, a visit to the Acropolis is probably on your bucket list, but even if you plan to avoid a trip up the hill, the city is scattered with ancient ruins. The columns at the Roman Agora, near the Monastiraki metro station, are great for photographing from below, against a blue sky. The National Gardens next to the parliament building is a green oasis in the city, where you can take your time and photograph its ancient ruins and mosaics without a crowd behind you waiting to get the same picture. There are even some impressive antiquities to see in several metro stations, not to mention what’s to see under the glass floor of the Acropolis museum, in Thiseio. In short, be prepared to snap pictures of any ancient ruins or artifacts you may stumble on while walking the streets of the city, because they’re everywhere! Abandoned buildings are always popular muses for Instagrammers, and there are plenty of them in this city. You can find a lot of beautiful and interesting ones on Pireos Street, between the neighborhood of Gazi and up to Omonia Square, according to Kountroumpis. On the other end of the spectrum are the grand historic buildings that are still in use. They often feature grand entrances, and fancy marble steps to pose on. Photographer Vasilis Siampalis (@billyheis), who has over 23 thousand followers, recommends taking a walk on Panepistimiou Street, and in particular, to the entrance of the early 19th century building of the National Library of Greece. It’s difficult to find a neighborhood in Athens that doesn’t feature at least some good street art, but for lots of it on streets where you won’t constantly be bumped into while shooting, hit Gazi and Kerameikos. Siampalis loves shooting here. Aside from the graffiti, “there are also walls covered in posters, which make great backdrops,” he says. If you prefer to stay closer to the center Exarchia is well-known for its street-art. 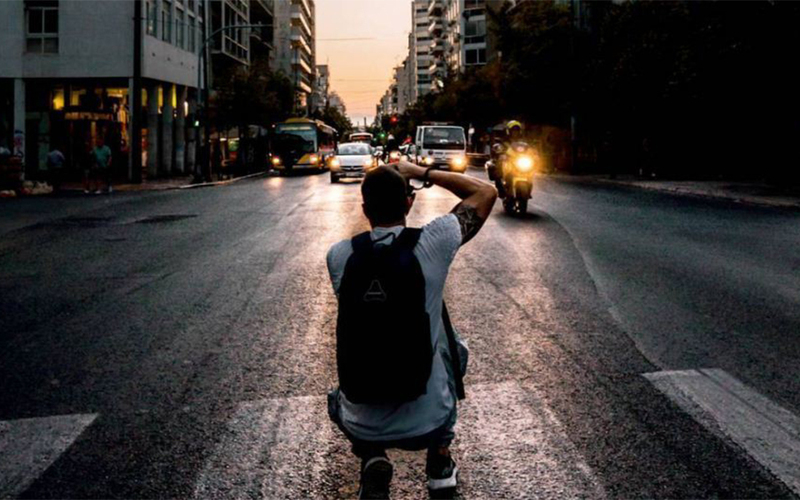 Koutroumpis gets thousands of likes on the shots he posts on Instagram featuring the streets of Athens. While it might be tempting to only point your camera at the small streets, where the sidewalks are more interesting, he recommends some of the main avenues. “Pireos Street, between the neighborhoods of Gazi and Omonia, isn’t only full of old buildings, but also has amazing light in the afternoon, as the sun sets,” he says, “and the bridges over Syngrou Avenue are perfect for capturing the lights of the cars at night”. The tunnels under the latter are also excellent spots, he adds, providing raw urban backdrops and dramatic light. It is almost as if instagrammability was one of the factors on the architects’ minds when they designed the new Stavros Niarchos Foundation Cultural Center, because everyone with a smartphone in Athens loves it. The style gurus are especially fond of it, and come here to pose in front of the huge walls and minimal and modern architecture. The center’s big park makes for great nature shots, picnic setups, and romantic countryside style portraits. Markella (@doyouspeakgossip), a Thessaloniki-based Instagrammer with over 10.5 thousand followers, often posts from Athens. She says the extravagant decorations of Little KooK makes Karaiskaki Street in Psyrri a favourite, and there are tons of other restaurants whose style and decorations make for excellent posts, not to mention great #foodography. Noel and Citylink are two other bar-restaurants that go almost as all out with the decorations as Little KooK during the holidays, and for particularly photogenic brunch food, try Penny Lane in Halandri or Oh Mama in Glyfada. Some of our favorites restaurants for gorgeous, industrial-charm backdrops and good light are Beauty Killed the Beast in Kerameikos, The Underdog in Thiseio (order their espresso tonic that you mix yourself – perfect for the Boomerang feature), Upopa Epops in Petralona, and CHE in Pireaus. Finally, a must-gram when in Athens (or Thessaloniki, where it originated) is the bougatsan at Estrella, on Romvis Street. It is a mashup pastry created by chef and blogger Dimitris Koparanis, pairing a croissant with elements from a Greek bougatsa, and it was the first Greek food to ever go viral on Instagram.